The system stays, prosecution aspects examined. 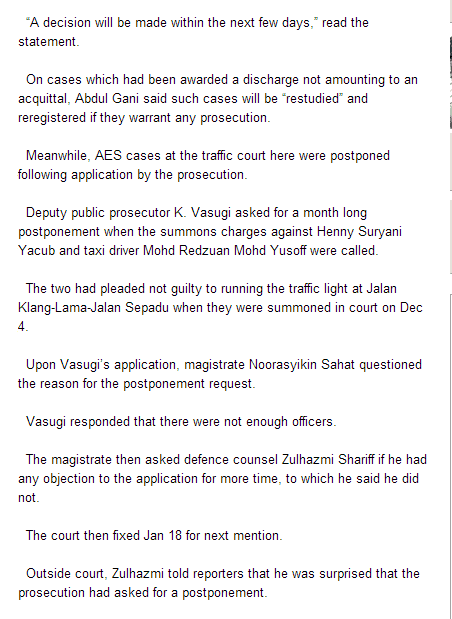 YB Mahfuz Omar was already celebrating "victory" against the AES. My friend Chegubard was claiming credit on behalf of his outfit, SAMM. 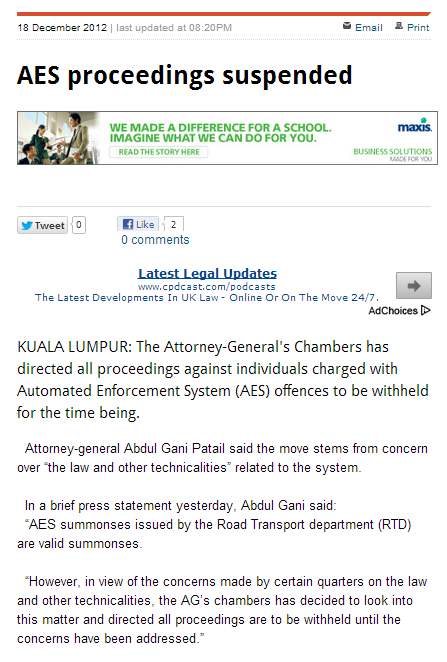 "We told you so, SAMM did say the government was going to suspend the AES," he said online. 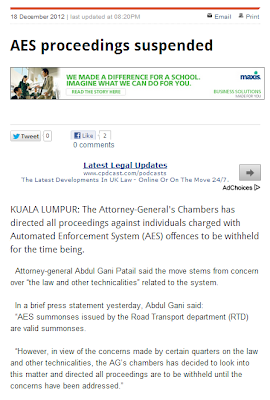 The government, however, is not suspending the AES. Nor is it reviewing the system. 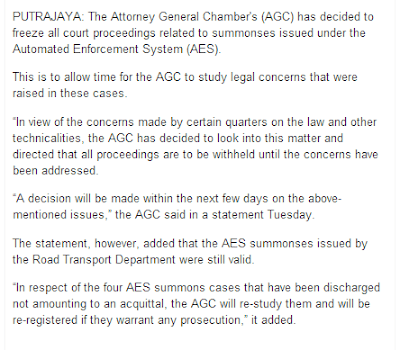 The AG has decided to freeze court proceedings related to summonses issued under the AES to study legal concerns raised. Repeat: Concerns on the law and other technicalities. A decision will be made on these concerns in the next few days. In the meantime, you beat that red light bro, and you will still get a black eye from AES. Read the Star's story below and following that my comments on why I don't think for a single moment that the authorities will review the system. The Automated Enforcement System or AES is internationally tried and tested. The AES cameras have helped authorities in the UK, Australia, the US, Singapore and elsewhere discipline motorists and reduce traffic accidents and fatalities (and more). In Malaysia, it is beginning to take effect. 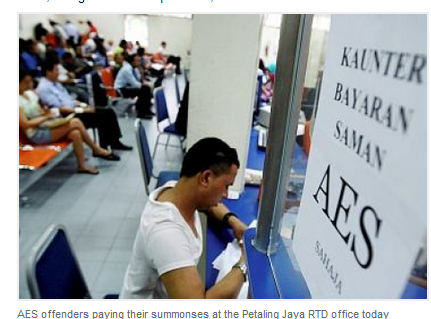 The number of summonses issued is down by almost 80 per cent from the time it was introduced. In other words, people are making sure that they don't break the law. The AES is forcing motorists to respect the traffic laws once again. They are starting to relearn to stop when the traffic light turns red! More than 16,000 people caught by AES cameras for breaking the speed limit and for committing other traffic offences have paid their fines. There is no reason, therefore, for the authorities to suspend a system that is working for the good of the majority of road users. again it is a response because of the impeding elections........what's the bet all technicalities will be cleared immediately after the GE? a ruling party that has no principles......? I want AES. I demand where the need is, AES should be implemented. Ha Ha. Surely the PR advocates are already pressing the keyboard aand ready to admonish me shortly. But I speak from my experience. One has been installed near my residency.It's effectiveness in combating traffic law inconsiderates? 99.9% effective. No longer I see or curse fellow motorist. The said AES is installed at Jalan Klang Lama and Jalan Sepadu junction. Those who are familiar here will surely agree with me. So far nobody is disputing those summons by police because its law. 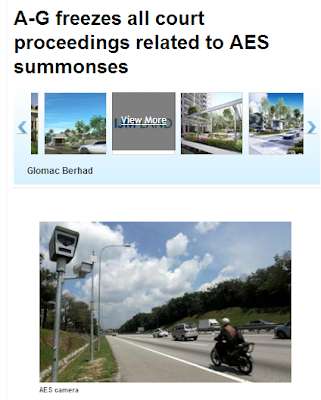 Bro as much I support the camera system to prevent the security but for AES is unfair system. 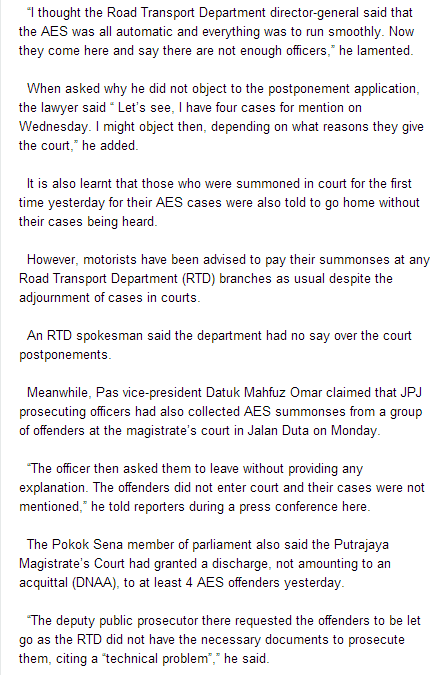 With AES, I can say 90% motorist cant escape the summon from JPJ. I also got summon in Malacca highway as the speed limit is 90 and I was drove at 100. U can claim that the I am over speeding but sometimes people have to speed because of the rich cars who drove 140 from behind at right lane give you a high beam and pushing u to accelerate the engine to move and give them away. 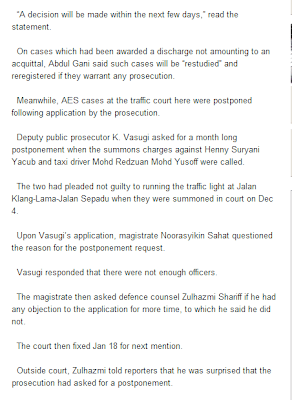 JPJ is also very arrogant as they dont want to tolerate the charges pf RM300 compare to the police summon who most likely give us 50% discount. I am BN supporter but seriously I dont have money to pay the summon. 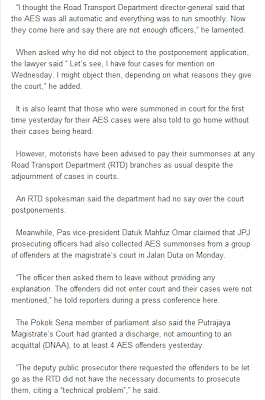 You can blame me for my offend but serious AES n JPJ is more cunning to make money compare to police traffic. Why was the law was passed in he first place ? Obviously it was never properly and carefully studied before having it legislated, just like most and not all the legislations in the country. Yet we have people like you condoning for the 'actions' taken and it also shows what the AG is doing, shutting the gates after the cows have run out of the enclosures. Typical examples of the actions of half cooked and incompetences ! There are over 1.8 million surveillance, speeding, parking cameras in the UK. They have had the AES-like cameras for years. Until today, there are people who continue to challenge the evidence caught by those cameras or/and the legality of those cameras themselves. There is no perfect system la, everything's work-in-progress. What we need to do is keep improving the execution and implementation of every system that benefits the majority of the people. 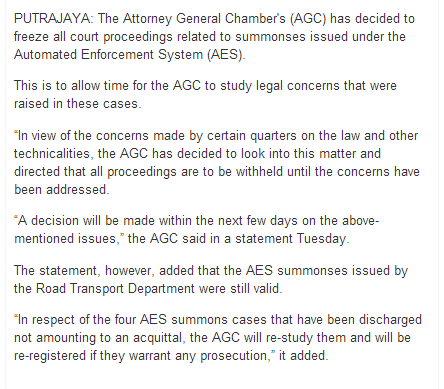 I see the main problem with AES is burden that the courts will have to handle the cases brought to them. Already with 14 cameras installed there were over 300K summons issued with only about 10K who had paid so far. Imagine the number of summons that will be issued when all 800+ cameras are installed. In UK, the AES don't cost RM200k each and private companies don't get the chance to profit from the rakyat. They also don't put AES to get speeding for over 30 or 50kph. Improving the execution and implementation that benefits the standard Ali Baba arrangement. Ali takes 70 pct while poor Baba takes 30 pct and is in charge of promoting the theft. Sad, isn't it ? The rm300 fine was imposed as a deterent. Now with AES can we ask the fine to be reduced? We should not have deterent upon deterent right? I think rm100 is fair for speeding. Between traffic accident & people dying as a result of it, and some cronies benefiting, I'll support the first cause anytime. If PR are true champion of rakyat and justice, they would have requested the rakyat to follow the law, approve systems like AES, but at the same time protest on the award of contracts to cronies - safety and lives of the rakyat should be the paramount priority. It is disgusting that we "allow" people to die because we are not happy with some guys making money. Why do you have to obey the person behind you than obeying the law? Even a normal, average person could do that, with common sense too. Secondly, JPJ had to do this since it is the procedure, to teach with discipline as the words of wisdom once said, "spare throw, spoil the child"